3. Model RC-5toPC ver2= 7Byte, address and Key code plus carrage return and line feed. Decodes many infrared codes following the NEC (TM) format and Philips (TM) RC-5. You may already own these codes from NEC or Philips. There are more than 65000 of these codes for the NEC Format. 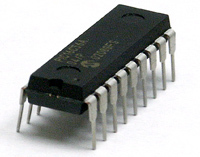 The Philips RC-5 code is 32 Address with 64 Functions. All "Universal remote" have these codes programmed in them. Notes: This infrared receiver was developed for the application where an infrared remote is desired to control a computer or computer program. This unit can also be used to control many devices that have serial communication ability. You can use many remotes supplied by others or provided by us. This unit can also decode many codes from a universal remote. With a universal remote you can control another unit such as a TV and your unit. such as a SETTOP BOX with the same remote. By using the universal remote in this application you can have access to many different televisions with the same remote. Custom Remote Systems, Inc. can design a custom Universal remote control for your Equipment. Software for the PC program to use this receiver can be very simple. You just scan the serial port for only the address and key code you want to operate your equipment and reject all others. This also allow the control of many different applications with the same receiver. The Receiver will decode and present to the serial port all codes, which follow the same format. This gives you approximately 65000 codes to use. If you already have a Customer ID code from NEC you can use your existing remote control. The IR2pc Version 6 send only 2 Bytes of information for every key press. The code this unit reacts to is fixed. It will only react to the NEC remote we hard code it for. A carrage return and line feed can be added to the output. RC5-IR2PC Ver2: Will decode all RC5 remotes control signals.